American Cetacean Society - San Francisco Bay Chapter — Scott Benson: "Leatherback Sea Turtles in the California Current: Why Leatherbacks Cross the Pacific"
With their immense size and peculiar appearance, leatherback turtles resemble species that inhabited Earth in the distant past. A swimming and diving machine, they are uniquely adapted for life at sea. This ancient mariner is the most widely distributed sea turtle, spanning tropical and subarctic waters worldwide. The endangered western Pacific leatherback turtle engages in the longest migration of any aquatic, air-breathing vertebrate. These turtles travel more than 7,000 miles annually between their western Pacific nesting beaches and their eastern Pacific foraging areas. The presentation will cover the biology and ecology of leatherback turtles, the current status of the population, challenges to recovery, and the actions we can take to help. Scott Benson MSC is a marine ecologist with extensive at-sea research experience throughout the world’s oceans. 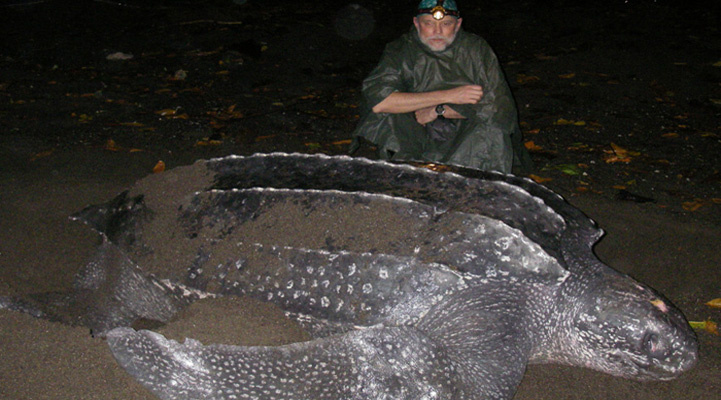 Stationed at Moss Landing Marine Laboratories, he is co-investigator of the SWFSC’s leatherback turtle ecology program and coordinates research on leatherbacks in central California and the Western Pacific. His education includes a B.A. from San Diego State University and an M.S. in Marine Science from Moss Landing Marine Laboratories. Since 1985, Scott’s research projects have included integrated studies of marine mammals, seabirds and leatherback turtles, with emphasis on abundance, distribution, ecology, and oceanographic patterns influencing the occurrence of these species. Scott has designed, coordinated, and analyzed results from ongoing surveys of marine birds and mammals in Monterey Bay , including collaborative at-sea ecosystem studies. He also coordinated a Monterey Bay National Marine Sanctuary program to monitor beach deposition rates of marine vertebrates. Results from these studies have successfully documented natural and anthropogenic impacts on seabirds and marine mammals. Recent field work has included systematic aerial surveys for leatherbacks and marine mammals in central California; telemetry studies of North Pacific leatherbacks tagged at-sea in central California, and on nesting beaches in Papua New Guinea and Papua, Indonesia; capacity building and nesting beach research in the western Pacific; and habitat studies of central California foraging grounds.